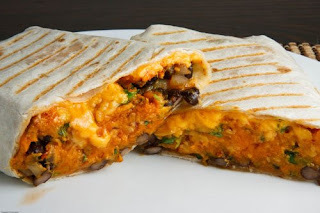 The name 'Burritos' means 'little donkeys' in Mexican Spanish, but I fail to see how the name lends itself to this simple, delicious dish - save that the donkey is a beast of burden and the burrito resembles a package. The humble burrito has undergone a glamourous overhaul since its migration to the USA, but I will stick to the original Mexican recipe as far as I can. Some of the US additions will be added below the original recipe. Burritos are simple and cheap to make and have a big flavour; much bigger than the sum of their simple ingredients. I have suggested substitutes for the hard-to-find items. Heat the oil in a large saucepan or wok until hot and add the spices, stirring until the seeds pop. Add the onion, garlic and stir fry until the onion is soft and starting to caramelize. Add the beans and stir. Mash a few beans with your stirring spoon against the pan. Continue cooking until the mixture is cooked through and resembles mashed potato in consistency. The resulting mash is known as 'frijoles refritos' - refried beans. Refried beans are delicious and an excellent source of protein and fibre. They continue to improve in flavour if cooled then refried again with more onion. I make large batches at a time and freeze it in portions before re-frying it. Wrap the tortillas in a clean tea towel and microwave them for 50 seconds. Taking one tortilla at a time, add a generous portion of frijoles to the center of the wrap and add a selection of the optional dressings. Fold or roll the tortilla wrap and arrange on a serving plate. Garnish with a selection of the optional dressings.